All brand products are authentic and officially sanctioned by the United States Polo Association. Grab a piece of the high life with fine merchandise from this exclusive, elegant and stylish brand which has a sporty twist. 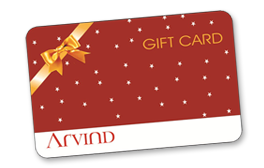 Redeem your Arvind Gift Card for merchandise and accessories at all participating US Polo Association Retail Outlets. Brought to you exclusively in India by Arvind Lifestyle Brands. 1. On ordering with us, you will receive an "U. S. POLO ASSN" E-Gift Card. This card is freely transferable to anyone of your choice and is redeemable for merchandise of your choice, across any of the participating U. S. POLO ASSN retail outlets. 2. This U. S. POLO ASSN Gift card is also redeemable at participating outlets of following brands: IZOD, GANT, ARROW, ELLE, US POLO ASSN and CLUB AMERICA. 3. Payment through gift card is not valid during sales and promotions at local stores. 4. This card is valid for 6 months from date of purchase. 5. This E-Gift Card is not credit/debit or ATM card. 6. The E-Gift Card balance is redeemable for merchandise only and will not be redeemed for cash. 7. In case the value of the merchandise exceeds the value of the Gift card, the difference must be paid by cash, credit card or debit card. 8. The E-Gift Card is not valid until activated or re-loaded. 9. This E-Gift Card will not be replaced or refunded if lost or stolen.